Richard Broadbent is an English catfish fan that I am looking forward to time to talk with again at this weekend's forthcoming UK catfish convention. Richard, like several of our broad congregation, has a particular interest in African catfishes and here are his thoughts on an uncommonly encountered one. "I have to say I’m surprised; the Cat-eLog indicates there are only two keepers of this African claroteid. Maybe it has something to do with a two foot plus adult size, making it not really suitable for the home aquarium? It is however encountered in shops every so often (here in the UK anyway and I believe also in Japan and the US). Although not striking to look at, it should definitely be considered by people with adequate facilities to look after these properly- it has an understated beauty of its own. This species' colour ranges from a darker brown dorsal surfaces with a pale belly through a range of greys, with an olive or silvery sheen. It has, as a quite unique identifying character, a rayed adipose fin, which is fairly easy to see in the fish once it reaches 4” or so & a spine develops around the 8” mark. Its barbels are quite long — the maxillaries often reaching just beyond the pectorals and occasionally past the dorsal. It has a wide, low mouth on a wide flattish head so it is no surprise that the diet of this fish in the wild is made up of animal matter — fish, insects, crustaceans — which can easily be replicated in captivity on a diet of prawns, cockles, earthworms, fish, carnivore pellets etc, as long as it is a relatively large particle size. It can be mixed successfully with fish too large to be considered a food item and that are not overly territorial or aggressive. I recall one very sad 8” specimen offered by a retailer, displayed in a 48” tank with a breeding pair of jaguar cichlids for tankmates with nowhere for the Clarotes to conceal itself. The only things it generally gets confused with are members of the genera Chrysichthys and Bagrus. The rayed adipose is a dead giveaway really and there should not be any confusion. They are widespread in a number of African rivers, particularly the Niger, Senegal, Volta and Nile, but also Lakes Chad and Turkana. The species name laticeps is derived from the Latin latus, meaning "broad", with the suffix ceps, meaning "head": clearly an apt description. 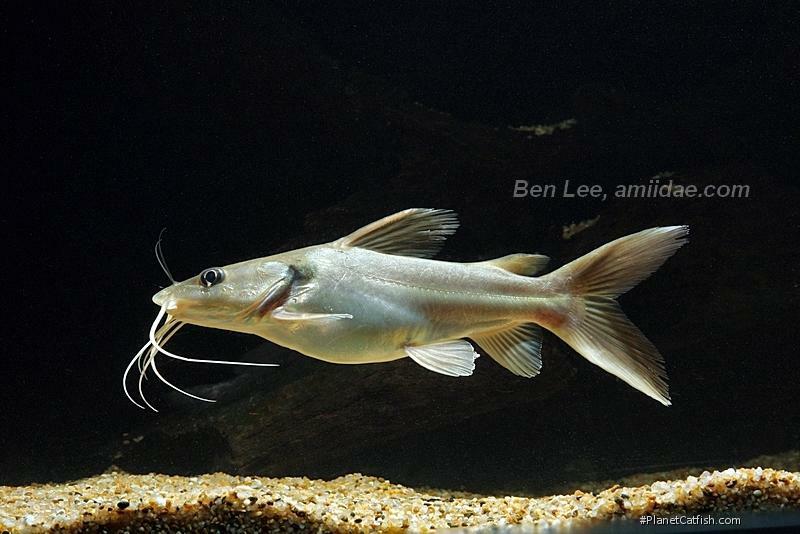 In aquaria it is not as fast growing as some of the more popular South American or Asian big cats & personally I’ve not encountered a specimen more than about 13-14 inches. Ones I have kept have shown little growth in the time I’ve had them. Additionally they seem less easily spooked than something like a Pseudoplatystoma or Pangasiodon. Different specimens in different set-ups have been noted to behave very differently: some spending time swimming through middle & upper water layers whilst others seem to spend a large proportion of time sitting on the bottom, in almost ambush-predator style. Aquarium breeding is unreported and this will obviously be due to the numbers kept by people as well as the large adult size, but it may well be a possibility if there was someone dedicated enough to want to seriously attempt it. Reproduction then may well be in the same manner as Chrysichthys which is documented. Imitation of the rainy season would be important for anyone attempting this. In summation, a extremely undemanding species, with a great character, but suitable for only those with gigantic tanks". Etymology Clarotes: Named after the ancient Greek Klaroten, a term for slaves (i.e. people with bent necks), in reference to the morphology of the head. Distribution Africa: Nile, Niger, Senegal, Bénoué, and Volta Rivers; also in Lake Chad. Feeding Feeds on crustaceans, insects, mollusks and fish.